Well, I am stalking The Knot's ideas again... so I decided to pull my favorite bouquets. I need to start making decisions on flowers soon so I can nail down a florist! 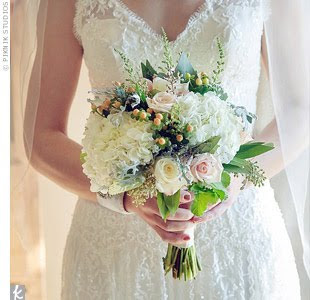 It could be that I just fell in love with her pretty dress, but this bouquet is lovely. 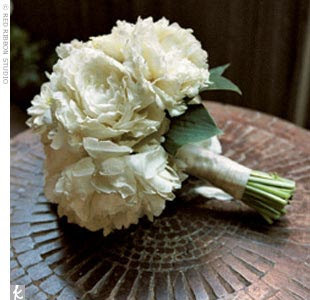 It was made of was made of blush-colored roses, cream hydrangeas, hypericum berries, and fresh herbs. 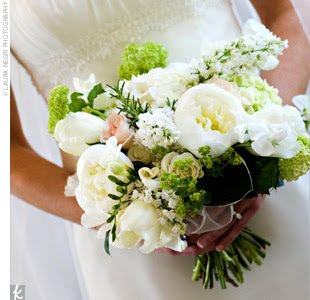 The bride's bouquet was a hand-gathered mix of peonies, hydrangeas, lilacs, viburnums, alchemilla, sweet pea, tulips, freesias, and roses in shades of cream, chartreuse green, and champagne. I don't really care for the gold tie, but the flowers look simple and pretty. 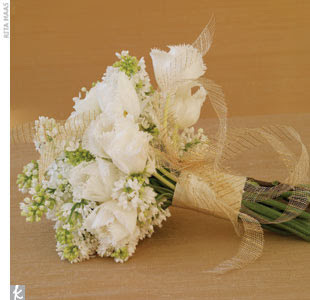 Composed of French lilacs, white ranunculuses, and honeymoon tulips. 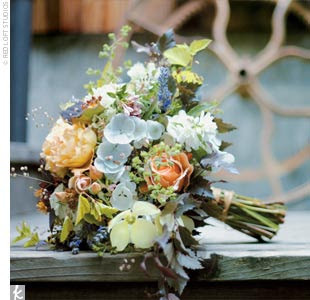 This has peonies, roses, thistle, lamb’s ear, Queen Anne’s lace, ivy, and snapdragons. 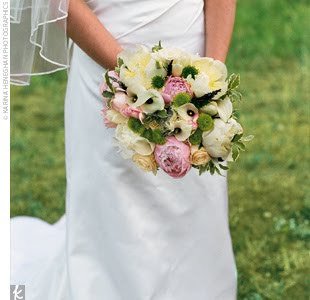 This bouquet was made up of peonies, dahlias, and roses. The pink peonies are gorgeous! 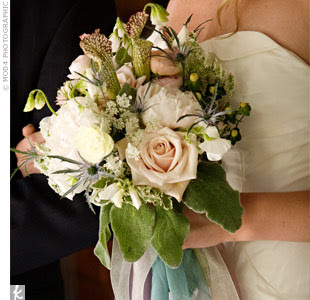 I think I would substitute the white calalillies for something else, but this bouquet is very pretty. I think I am falling more in love with peonies the more I look at them! 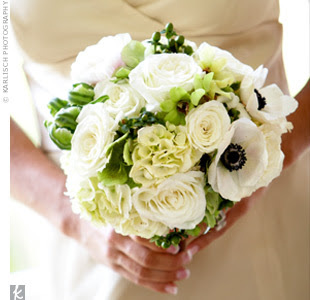 Champagne roses, hydrangeas, cream anemones, and green hypericum berries. 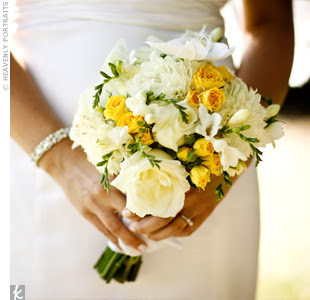 This is a white, pale yellow and bright gold bouquet filled with orchids, ranunculus, roses, and mums. A bit brighter than what I picture going with my dress... but still very springy and cute! So, anyone want to chime in with their favorites? Sigh. So many choices for flowers... this one is difficult! I do love the more romantic ones like the first choice. 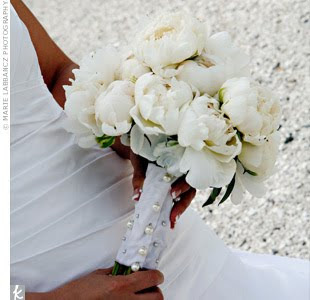 However, I love all white peonies, and I think it is unique to add different elements in the bouquet such as succulents and herbs. More flower posts to come for sure! Am I allowed to ask for these as wedding gifts? Grandview Manor, Our Reception Spot! Checking Things Off That List!